In 1946 a number of political parties were created by exiled Albanians in Italy. One of these groups was the National Independent Bloc – Bloku Kombetar Independent (BKI) headed by Dr. Ismail Verlaci, Kapidan Gjon Markagjoni and Kapidan Ndue Gjon Gjomarkaj, along with 21 other charter members . In 1948 the Foreign Branch ‘P’ of the CIA was approached by the Italian Navy Intelligence, who were supporters of the BKI, and presented with a proposal for the mounting of a joint operation in Albania. The BKI was the first organization in exile to participate in the initial operations to infiltrate Albania in support of the Nationalists in their fight against the communist regime of Enver Hoxha. There have been many discussions as to who, where and when the initial uprising in Albania, supported by the West, commenced. This letter was hand carried by Ndue Pjeter Gjomarkaj and dated six days before the actual drop of the nationalist fighters into Albania. After much research I am now delighted to show proof that this mission was indeed initiated by the Bloku Kombetar Independent and that the operation was the catalyst for following operations, which would last until 1953. The following report OBOPUS BGFIEND VOL. 13 (BGFIEND OPERATIONS)_0006, dated 3 May 1948, confirms beyond a shadow of a doubt that the mission was indeed carried out by members of the BKI. “The Albanian leader in Italy who has worked with the Italian Navy and OSO in mounting this operations is Ismail Verlaci”. Upon the arrival in Albania of Ndue Pjeter Gjomarkaj and Ndue Melyshi they held a meeting of the Nationalist fighters, in Qafmolle, where they read the letter and instructions given by Kapidan Gjon Markagjoni and Kapidan Ndue Gjomarkaj in Rome. 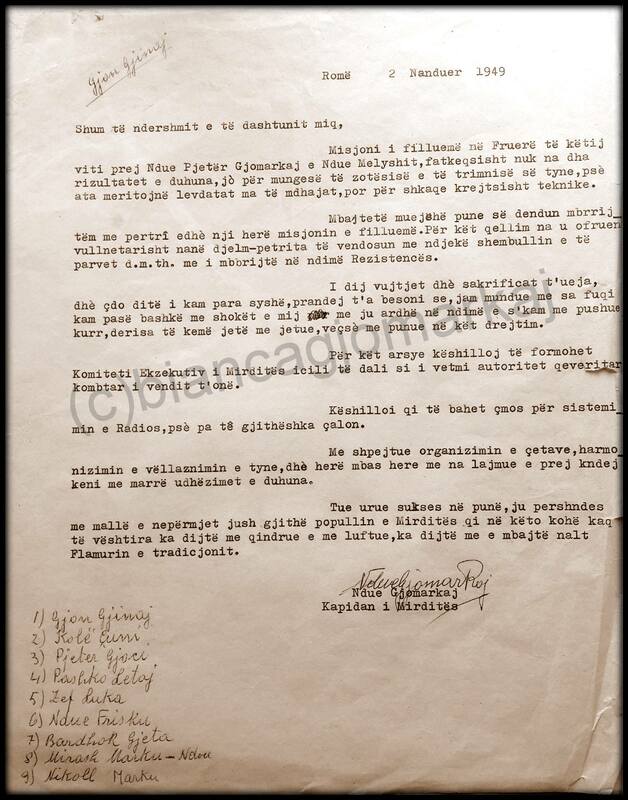 The National fighters welcome this letter and its guidelines, and based on the decision given by Kapidan Gjon Markagjoni and Kapidan Ndue Gjomarkaj, it was decided at this meeting that Ndue Pjeter Gjomarkaj, a cousin of Kapidan Gjon Markagjoni, should be elected leader of the resistance, while Ndue Melyshi his right-hand man. Split into small groups and disperse through different counties. Meet and talk with the people, to find safe accommodation and pursue activities against the communist regime. Scheduled the next meeting for 1 July 1949 to be held in the Shqopen Murgjës. On the dates of 1-3 July, the Assembly was held and it was decided to reorganize the organization originally created by Kapidan Dr. Mark Gjon Marku in March 1945, where after his death on June 14, 1946, the organization was led by his brother Kapidan Llesh Gjon Marku, until he fell in combat on 14 August 1947 in Munegj. Reorganize the military organization in Mirdita. According to the order in the letter, select Ndue Pjeter Gjomarkaj as the leader. The Council of the Organization will have these members: Ndue Melyshi, Make Dod Lleshaj, Mark Jak Bajraktari. The Council included all fighters. Authority for retribution is in force. Death penalty and execution of communist Bardhok Biba, Commissioner of Mirdita, and Deputy in Tirana; to rescue the people from such a dangerous man. It was decided to hold another meeting on 7 August 1949 in Shqopen e Mungjes. On August 9th they came together to review the situation and during the discussion the news that Bardhok Biba, who had gone to Kacinar to gather workers to send for labor across different places outside of Mirdita, would go to Shpal that day. The news was confirmed and everyone decided on his execution. For that task they assigned a fighter of the ‘retribution body’ and the shooter laid in wait at Valmer’s neck where he successfully executed the assassination. Ndue Pjeter Gjomarkaj with firm determination and his own signature released the statement of execution on behalf of the Resistance Committee. The CIA recognized that Bardhok Biba was the traitor responsible for the ambush and murders of Kapidan Mark Gjon Marku in June 1946 and Kapidan Llesh Gjon Marku in August 1947. Plan II, mentioned in the memo referenced above, refers to the follow-up mission which was conducted in December of 1949. The reference to Plan II in the above document is also very important to the history of the BKI as it refers to the second mission which included nine members of the BKI who were dropped in the Kukes region of Albania on the night of 28 December 1949. This second letter below, dated 2 November, 1949, signed by Ndue Gjomarkaj, Kapidan of Mirdite, lists the names of the nine member team led by Kole Cuni and Gjon Gjinaj, names that the following report CIA KABASHI, SHAQIR_0045 does not list because they were not provided during the debriefing of Kole Cuni in 1954. The letter was read to the Nationalist fighters as soon as they were assembled by Gjon Gjinaj.